A lot of reporters and fans have been putting together their mock drafts for the upcoming NFL draft, and many guesses converge on the Eagles taking a cornerback with their first round pick. That’s a scenario I don’t actually find likely, based on recent precedent. Typically mock draft “experts” are guessing based on the Eagles most glaring weakness or biggest roster hole. They assume that the Eagles will look at their most vulnerable position and attempt to draft a player to plug into that hole. In truth, this isn’t a bad strategy to create mock drafts — it’s how most of the NFL conducts business. But the Eagles aren’t like everyone else. Last year, I examined the Eagles recent strategy of drafting and concluded that the team rarely drafts players to fill an immediate need. For example, in 2007 the team drafted quarterback Kevin Kolb while Donovan McNabb still was in his prime. Neither DeSean Jackson (2008) or Jeremy Maclin (2009) were immediate need picks, although they both contributed as rookies because of injuries. And then last year the Eagles jumped up in the draft but didn’t do so to fill holes in the secondary. They went with a more long term need: Brandon Graham to be a pass rusher opposite Trent Cole in the years to come. This philosophy suggests that the Eagles don’t want to count on rookies maturing into starters in one short offseason. If they’re ready, sometimes players can step up after injuries (Jackson, Maclin, Nate Allen, LeSean McCoy), or even beat out veterans for the opening day job (Brandon Graham). But the emphasis with the Eagles is never to draft a player with that intention — they don’t expect instant success. With this in mind, it’s unlikely that the Eagles will draft a player at a position that they are looking for an immediate fix. That would especially single out right cornerback, perhaps the weakest link on defense. Some mock drafts have the Eagles taking a player like Colorado cornerback Jimmy Smith or Miami’s Brandon Harris and inserting him directly into the starting lineup across from Asante Samuel. 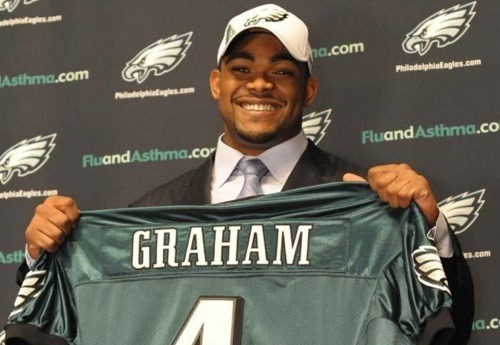 In line with the Eagles draft philosophy, that would be a bad move for 2011. Less than half of all defensive backs taken in rounds one or two in recent drafts were able to start even 8 of their team’s 16 games. Counting on a rookie to step in and solidify that spot is unreliable. Maybe a year or two later, but not right away. Instead, the team would target one or more free agent corners (such as Nnamdi Asomugha) to fill the void. That’s why I think the Eagles are more likely to target the offensive line. Nabbing a highly-rated lineman who could compete with a returning Jamal Jackson, an underperforming Winston Justice, or any of the questionable guards would fit with the Eagles recent history. If the rookie needed more time to adjust, there would still be veterans ahead of him — but there would be the opportunity for playing time. Defensive line might fit also, where another player to step into the mix long term (now that Graham’s situation is in jeopardy) would be desirable. Additionally, the current players along both lines may not fit with the techniques preferred by the new position coaches Andy Reid hired this offseason. The draft is less than a month away, and I could end up being wrong. But don’t be surprised if the Eagles don’t take your favorite cornerback with the 23rd overall pick. Originally published at NBC Philadelphia. Photo from the Philadelphia Eagles. Tagged with Philadelphia Eagles, NFL, 1st Round, 2nd Round, NFL Draft, Offseason, Brandon Graham, Kevin Kolb, DeSean Jackson, Jeremy Maclin, LeSean McCoy, Cornerback, Jimmy Smith, Brandon Harris, Asante Samuel, Rookie. March 28, 2011 by Brian Solomon.